Before you start with the process of de-cluttering your PC, it would help to know which folders are occupying the most space - and to do this, there is no better program than SpaceSniffer. Select the drive you want the software to analyze, and it 'sniffs' through its contents to measure the space your data occupies on that partition. The results are displayed in the form of a huge rectangle that represents your drive, populated by smaller rectangles to represent files and folders within. The larger the file, the bigger the rectangle, so you know what is occupying the most space in a single glance. After SpaceSniffer is done, you can just roll your cursor over any 'rectangle' for information on when that file/folder was created, when it was modified, and when it was last accessed. Double-clicking on any folder takes you one level deeper to show you the sizes of the files it contains. Armed with this information, deleting trash just became easier. You can download SpaceSniffer here. If your desktop is a nightmare to navigate, then Fences is what you need. The software lets you create transparent tiles that are, in effect, folders for your data. For example, to clear up your desktop, just move your Word files to the Documents tile you have created for it, your pictures to the Photos tile - or however else you want to sort and segregate your content. Fences lets you see all the files you have stored in the transparent tiles without opening it. And here's the best part: double click on your desktop and all your tiles are hidden, giving you a clean screen. Double-click again to make the tiles reappear. Some of the biggest hoarders of space are the duplicate files on the drive. For instance, we might have multiple copies of the same photos; or have the same MP3 in different folders. And in no time, it's almost impossible to keep track of all the copies we create on our large hard drives. Duplicate Cleaner Free to the rescue. As the name implies, this software scans your PC for copies of the same file. And you can also search for duplicate songs by tags. Run a scan to find detailed information such as the number of duplicates, the amount of space they occupy, file path, size, and creation and modified date. All that's left for you to do is select the duplicates and delete them. Of course, with the Pro version, you can find similar images and photos (even if they're edited, rotated or resized), search zip archives and even store your searches. So you have de-cluttered your machine and it's now in tip-top condition. 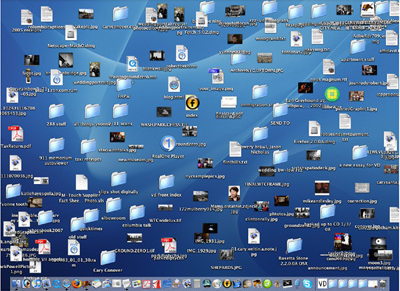 But how do you ensure that your computer remains this organized? Well, use DropIt. 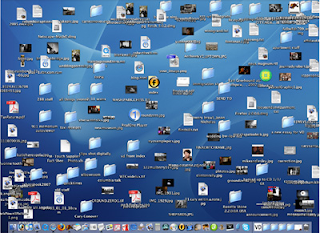 Run the software and it creates a floating icon on the screen that becomes the central point to sort all your new files. You can then create rules for different file types. For instance, to move all '.jpg' files to the 'Photos' folder; move '.mp3' to the 'Songs' directory; '.avi' to 'Movies' ; and so on. Additionally, you can configure DropIt to automatically perform 14 different actions on your data (copy, compress, extract, rename, delete, open with, upload, send by mail, create list, create playlist, create shortcut, copy to clipboard, change properties, ignore), filter files by name, directory, size, date, content, etc. You would also like:Tools for cleaning WEB space.